September and October might not have official holidays in the Philippines, but Filipinos love Oktoberfest. This year the largest Oktoberfest 2018 parties will rock in Sta. Rosa Laguna, Makati, La Union, and Pasay. Oktoberfest first came to the Philippines in 1938. For eighty years since then, the German Club Manila has hosted an overnight feast featuring Bavarian beers, cuisine, fun games, and performances. San Miguel puts a Filipino twist on the famous festival with OPM rock concerts and street parties. The San Miguel Oktoberfest started as a sponsorship event over the radio in 1982. It has since grown into a sprawling celebration of local beer and music across the country. In fact, the Department of Tourism even granted it “national fiesta” status in 2012. If you’re planning to join this year’s festivities, you should first know when and where all the action will be. 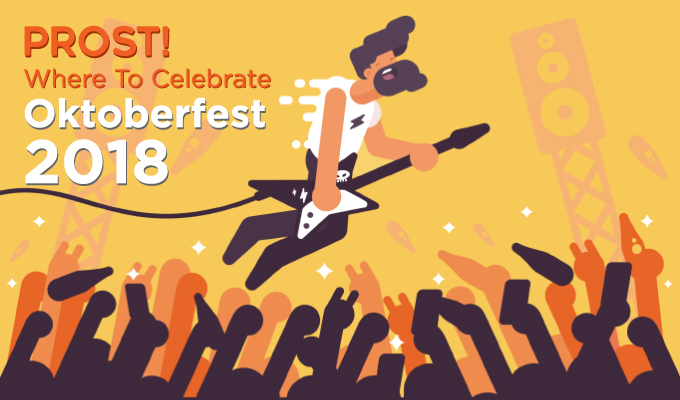 Check out the venues for Oktoberfest 2018 and share these article to your friends! For 2018, the San Miguel Oktoberfest will be taking place in three different venues. The first of this year’s three official parties will hit Greenfield City, in Sta. Rosa Laguna, on October 13. Two weeks later, on October 27, Circuit Makati will come alive with the San Miguel Oktoberfest Mad Fest. San Juan gets to party along on the same night during the La Union Surfing Break. Partygoers to any of these three events will be greeted with free entrance and a free glass of beer. Resorts World Manila is joining the festivities with its own Oktoberfest party from September 27 to October 1. Rox Puno and the Itchyworms will be performing at the event’s Media Launch in Newport Mall’s Plaza on Sept. 27. The Beer Bazaar opens on Sept. 29, featuring Keren & Mark and Brass Pas Pas Pas Pas. Nino Alejandro and Barbie Almalbis will be providing live entertainment on Sept. 30. Several restaurants in Newport Mall are offering dining specials for all of October. Participating restaurants include Cafe Maxims, Victoria Harbour Cafe, and Franks. Living a little far from these venues? You still won’t miss out, because bars all over the Philippines are also offering buy-one-take-one promos for San Miguel beer from 7pm to 9pm. This promo runs for all Fridays of September and October. The event’s Facebook page has a handy list of participating bars from all over the country. For a more traditional Oktoberfest celebrations, head over to the German Club Manila’s Oktoberfest tent at Solaire. Sit back and listen to the rich music of the Bavarian Sound Express while chugging down free-flowing Weihenstephaner Beer. Try raising a toast to the festival itself, which is now on its 80th year in the Philippines! It also helps arrive in traditional Bavarian attire (dirndls for the ladies and lederhosen for the gents). This celebration runs from October 4 to October 6 and opens at 6pm. Tickets start at P4590 for regular selling, with door prices starting at P4860. Make sure that someone in your family knows where you’re going and who you’re partying with. Charge your devices before heading out. A power bank comes in handy. Have emergency cash on hand. Go with a group of trusted friends. Check up on each other every now and then. Use the buddy system for restroom runs. Someone you don’t know offers you a drink? Play safe and say no. Don’t use party drugs. If you spot another patron using or selling them, quickly inform the authorities. Plan the trip home in advance. Don’t drive home drunk. Know your limits and drink moderately. Try to eat a bit before the party itself. If your stomach isn’t empty, you won’t get drunk so quickly, and it’ll be easier for your body to flush out all the booze later on. Excited for this year’s Oktoberfest? Bookmark this post and save the dates. You can also visit the German Club Manila’s Oktoberfest 2018 site and the San Miguel Oktoberfest’s Facebook page for more details. Get the latest updates on local events and promotion strategy by checking out our blog.